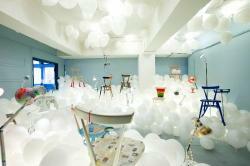 designjunction is proud to announce Teddy's Wish as its official chosen charity for 2014. Teddy's Wish raises funds to aid research into the causes behind SIDS (sudden infant death syndrome), neonatal death and stillbirth and support grieving families. 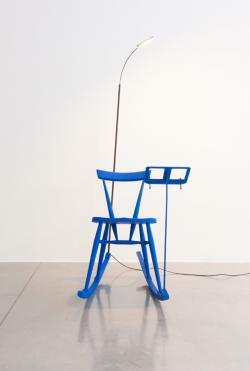 The exhibition, ‘A Child’s Dream’ presents customised versions of two of the most iconic British designs the Anglepoise® Type75™ Mini desk lamp and stacking chair from ercol’s originals collection. 20 leading UK based designers in the field of architecture, design and graphics have created one-off items to raise funds for Teddy’s Wish. When we are young, the jungle is a mysterious place, a realm of adventure and the imagination. For our chair, we wanted to reference the magical worlds that you can disappear to in dreams. Since it launched in 1964, TOPSHOP has become a major British style authority and one of fashion’s biggest success stories. In 1994, a TOPSHOP flagship store was born, as the brand took over a 90,000 sq ft space at London Oxford Circus in the heart of the West End. It remains there today, and is considered the world’s largest fashion store, attracting over 500,000 shoppers each week. A pioneer of design collaborations, TOPSHOP is also well known for nurturing young talent, including Christopher Kane, Meadham Kirchhoff, Hussein Chalayan, Richard Nicoll and Mary Katrantzou. TOPSHOP is the only high street brand to show on schedule at London Fashion Week, and has recently celebrated ten years of sponsoring New Gen – supporting young British designers and giving them a platform to show within LFW and promote their collections to the international press. Also a huge success is the TOPSHOP beauty line, tapping into a wealth of existing knowledge of the hottest trends, the TOPSHOP design team has developed a directional and fashion led way of approaching colour in cosmetics. TOPSHOP has 319 stores in the UK, with a further 137 international franchises operating in 40 countries. The USA sites are fully owned flagship stores, with further expansion of the TOPSHOP brand throughout the US with department store Nordstrom. 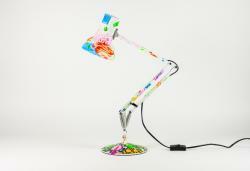 Using the human-like features of the Anglepoise lamps - their heads and jointed limbs - Paul Cocksedge has created an interactive piece that is both poignant and joyful. The lights only come on when the two heads touch each other, and whichever way you position them for that touch, it will stir a visual memory of a child nuzzling up to its mother. It can be seen not only with humans, but across the natural world: two swans with their necks entwined, giraffes gently touching heads, a baby bear seeking protection with its mother. This reconfiguration of the classic Anglepoise taps into the imagination whereby everyday objects take on human attributes, in this case to embody a gesture of caring and affection that is universal. Kristjana S Williams is an artist whose experience spans illustration, interiors, fashion and design. Kristjana is a regular exhibitor at the London Design Festival, exhibitions include; 'An Interactive Print Journey' comprising of four large scale murals at the Victoria and Albert Museum and a solo show at Shapero Rare Books where Kristjana's prints sat alongside the masters of victorian engravings. In Autumn/Winter 2012 Kristjana was asked to show her new collection at the Paul Smith Globe Store where the prints sold in record numbers. The beginning of 2013 saw the work receive Highly Commended for 'Best Use of Colour in the Arts' at the Dulux Colour Awards, completing a commission for Osborne and Little and art directed Wilderness Festival for the third year running. The illustrations juxtapose strong graphic lines with intricate victorian engravings creating incredibly striking and unique art work. Comprising of very intricate collages of material that have been collected from victorian engravings, photographs taken, found objects and real leafs and twigs. A limited selection have been delicately hand-gold leaved in order to create an utterly desirable and innovative piece of work. 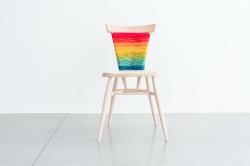 A chair representing the fusion between fashion and furnishing fabrics. 2319 comes from the bus number and two platform numbers of the transport the chair travelled on to its final creation space. The fabric used is all from Liberty Art Fabrics Interior and Fashion collections. 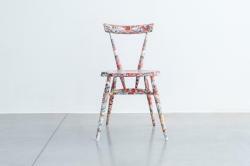 Many of the designs are no longer available making the chair a one off collectors piece for all lovers of Liberty Art Fabrics. The main seat is covered in designs 'Cranford' and 'Eileen' designed by Grayson Perry and inspired by The BBC Drama 'Cranford' and 'The Scream' by Munch. The back two legs showing marbles and Dominos were designed by Michael Angove, the front two have designs again by Grayson Perry but also by Michael Angove, Mike McInnerney, Anj Smith and Tsumori Chisato. The chair spokes underneath show prints by Mr Minagawa, Angie Lewin, Steve Parkes and Paul Morrison along with Liberty archive birds and snug, the first computer generated Liberty print. Grayson Perry 'Philippa' bicycles, Liberty archive Cars and Floral Mawston Meadow decorate the back rests. All prints were specifically chosen for their relationship to things you might do and places your mind may take you when relaxing on 2319. Emma has been part of the Liberty Art Fabrics Design Studio for over twenty two years and headed up the Liberty Art Fabrics Fashion Fabrics Design Studio for over sixteen years, being responsible for thirty collections before moving over to concentrate on Interior Fabrics in May this year. Emma studied at Winchester School of Art and Design and Loughbrough College of Art and Design, her design philosophy stems from the originality and innovation entrenched in her mind at art college. 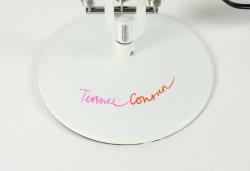 Emma is part of an amazing textile charitable organisation called 'Texprint' which supports the most talented students annually to become the stars of the future. 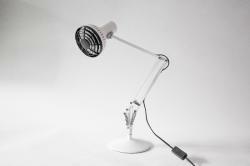 Title: 'Refreshed' an Anglepoise desk fan. 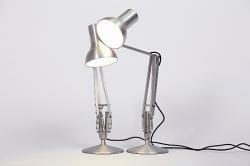 When George Carwardine first invented the Anglepoise lamp, produced by Herbert Terry & Sons - now Anglepoise Ltd and still run by direct descendant Simon Terry - they marketed the lamp as the 'energy saving lamp'. Why? Because before Carwardine invented the task light, enabling the light source to be moved into position exactly where light was needed, people would simply increase the wattage of their overhead and standard lamps to raise lumen levels. 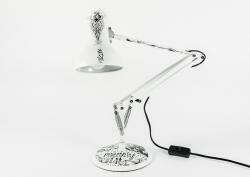 But, by taking the lamp directly to the area of activity an Anglepoise could use a much lower wattage bulb. The same principle is applied here. When working at your desk, you don't need a hugely powerful fan swinging left to right, sometimes buffeting you and any paper on your desk and pointlessly blowing air around a room. You just need to position a quiet, soft breeze exactly where you need it most. In your face. Anthony founded his London product and furniture design studio in 1998 creating objects that express simple narratives and re-imagine the everyday things that surround us. Initially designing and manufacturing his own range of lighting, Anthony’s work is diverse, working at the junction between product design and communications. Anthony has worked for Audi, Veuve Clicquot, Finlandia, Skoda and Red Bull bringing the essence of brands to life. 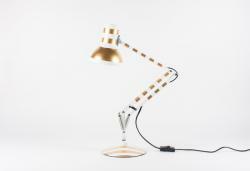 Tom's Anglepoise® has received an equally impressive copper makeover, the shade being replaced with one of Tom Dixon's own Mini Copper Shade's giving the desk lamp an entirely new structural form. 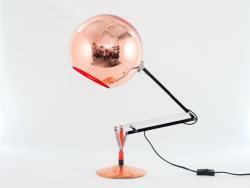 Tom Dixon is a UK based design company that specialises in lighting and furniture. 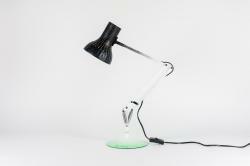 Their range of lighting and furniture is renowned for its innovative contemporary design and construction. Using highly technical manufacturing processes Tom Dixon is able to produce a range of unique and stylish pendant lighting. Tom Dixon fell into design by accident when he found himself with “time on his hands” while recovering from a motorcycle accident. As an art school drop-out with no technical training, he taught himself how to become a designer-maker in 1983 after discovering welding when trying to repair his motorbike. 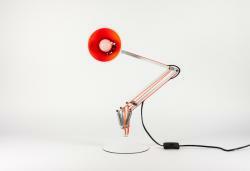 Reaching iconic status Tom Dixon was awarded the OBE for services to British Design in 2000. Through-out his unorthodox career Dixon has created furniture and lighting using a myriad of ground-breaking processes and unusual materials - creating artistic and commercial pieces. In 2002 Tom Dixon and David Begg started Tom Dixon the company, and have developed a collection of contemporary lighting and furniture including the acclaimed Mirror Ball Pendant and the Copper Pendant. 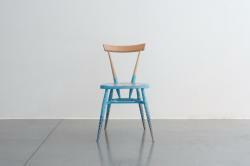 The transformation of the chair pursuits a new look of bold volumes and soft edges, a contrast to the original. 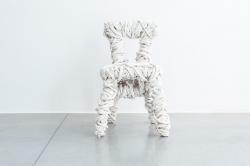 Wrapping and knotting various types of ropes gives a rich texture around the chair followed by a thick industrial rubber coating finish. When thinking about the title 'A Child's Dream' the first thing that springs to mind is colour. How bright and vibrant a child's dream might be, full of bold colours and shapes and a great innocence. We have focused on those bold colours and shapes in an irregular, sporadic fashion, bringing playfulness and purity to the lamp. Wilkinson Eyre Architects, twice winners of both the prestigious RIBA Stirling Prize and the RIBA Lubetkin Prize, is one of the UK’s leading architecture practices. Its portfolio of bold, beautiful, intelligent architecture includes the Guangzhou International Finance Center, one of tallest buildings in the world; the giant, cooled conservatories for the Gardens by the Bay in Singapore, the new Maggie's Centre in Oxford and the acclaimed temporary structure of the London 2012 Basketball Arena. 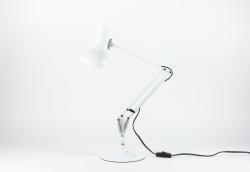 PearsonLloyd is an award winning industrial design and innovation consultancy based in London. The studio was founded by Tom Lloyd and Luke Pearson in 1997 to offer product design services and strategic thinking in sectors that have demanding spatial, ergonomic and social needs, including the workplace, healthcare, transport and urban environments. With a history of implementing strategic change within these areas, the studio delivers real value to their clients through research-led innovation and industrial design that focuses on practical commercial solutions that are pragmatic, elegant and memorable. 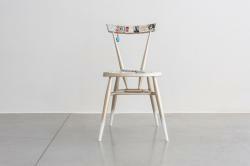 'We love the honest, expressive, utilitarian nature of the ercol chair and the integrity of its detailing. 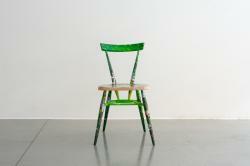 Our proposal is to add functionality to the existing chair so that it supports activities beyond simply sitting. 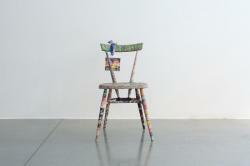 Created in collaboration with Mike Fairbrass and the RSHP Modelshop. A former cabinet-maker and sailor, Rogers earned his MA in design from the Royal College of Art. There he met Shona Kitchen with whom he cofounded Kitchen Rogers Design (KRD) in 1997. Kitchen and Rogers' projects included the Comme des Garçons store in Paris, the Al-Ostoura luxury department store in Kuwait City, and the Michel Guillon flagship store in London. In 2004, he founded Ab Rogers Design (ARD), now an established studio that plays with colour, materials and function to inject a sense of poetry, magic and wonder into the everyday world. ARD’s multifaceted work includes designing for hotels, restaurants, retail environments, domestic interiors, museum exhibitions, websites and brands; past clients include the Pompidou Centre, Tate Modern, Science Museum, the Australian Centre for Moving Image, Conde Nast, Pizza Express, Price Waterhouse Cooper and Parc1, a mixed-use development in Seoul. creativity producing work for a variety of international clients. with a retrospective show in Paris. Members Clubs, Restaurants and Bars and Resorts. 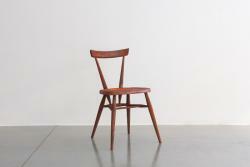 Rachel is the creative director for Ercol - furniture made the way it should be. Founded in 1920, design has always been at the heart of ercol – design for comfort, design for function, design for beauty. We combine practicality with looks, be it the copious storage of our sideboards, shelving units, bookcases and display cabinets, the comfort of our studio couch and of our chairs, or the utility of our coffee tables, lamp tables, desk and media units. 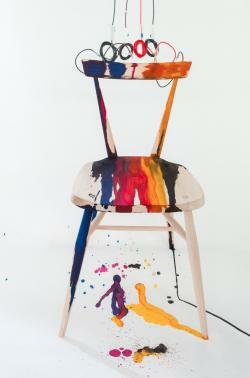 Two students from Princes Risborough School have contributed their own homage to their music heroes with an adaptation of ercol’s classic Stacking Chair. Aspiring musicians, Keane Spenlé and Luke Page, who are both 11 GCSE students at Princes Risborough School, have referenced their music heroes in the piece. Luke says; “For me Hendrix represents more than just a guitarist, he is an artist. The way he painted his music was like nothing before him. Jimi is one of the most respected and recognisable figures of modern music. Although he isn't with us today his legacy is undeniable. 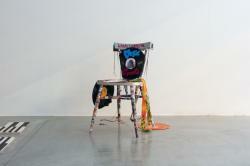 Other elements that feature on the chair include melting vinyls symbolising Dali Clocks, Swirling Psychedelic patterns similar to those seen in "The Starry Night" and a Hans Christian Anderson quote "Where words fail music speaks". Welsh born Bethan Gray is one of Britain’s most celebrated furniture designers best known for her liveable, honest and warm designs. She first came to recognition when she was awarded the Habitat Innovation Award by Tom Dixon at New Designers in 1998 and has since won three Elle Decoration Design Awards. Working closely with Matthew Hilton during his residence at Habitat, Bethan was made Head of Furniture Design before setting up her own studio in 2008. Most recently Bethan has established G&T - a collaboration with Thomas Turner. With a passion for the warmth of wood and leather, as well as the appeal of stone, Bethan is inspired by shape, texture and detail, and influenced by her travels and the everyday objects that that surround her. Donna Wilson set up her company in 2003 after making odd knitted creatures for her final show at the Royal College of art. The creatures sold out and since then she has built her business designing and making a collection of curious cushions, luxurious lambswool blankets, and variety of products for you and your home. I am a wordsmith, a mapmaker, a typographer, ragamuffin and freestyler. What I do makes me smile, and I am fortunate to be asked to do what I do for all and sundry, from the smallest personal piece to huge scale works. I spent 15 years as a professional graphic designer freelancing across London and worked on major branding, interior and retail design projects as well as working with some of the leading design agencies in the world. I have taken what I know as a graphic designer and incorporated that into my love of illustration. Its a happy combination. My tools of the trade are Faber Castell pens and layout pads, a massive imagination, not taking life too seriously and great clients. A good set of ingredients. Geometric shapes have inspired children and influenced architects for centuries. They have symbolic significance in dreams, in nature and in architecture. Here, they parametrically morph into one another, fading between timber, blue, and dark blue, reminiscent of wear after long term use. 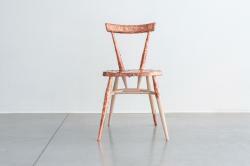 Wrapped in sheets of solid copper Tom's ercol chair has been morphed into a materialistc masterpiece, playing on the juxtoposition of the smooth wood against the hard, beaten copper sheets. London‐based Greek designer Afroditi Krassa is extraordinarily proud of being an industrial designer, a term that many designers still render rather unsexy. Born in London in 1974, Krassa was raised in Northern Greece before returning to the UK in 1996 to complete a BA in Product Design at Central Saint Martins. An initial interest in graphic design was pushed immediately to one side as she discovered the playful approach she could apply to industrial manufacture. On graduation she was quick to gather attention for her rebellious attitude to product design; a stint at Priestman Goode was followed quickly by a position at leading design firm Seymour‐Powell as their first‐ever female designer. and experimental use of materials set her apart from other graduates of the year and humour continues to play a large part in her work. hospitality design, creating pieces for Sketch and being invited to work on the initial design concept for pioneering sushi chain Itsu. Delivering expertise beyond simple interior design, Krassa and her studio took the helm for all aspects of design and branding, from packaging and menus, to lighting, ambience and music. This holistic, 360‐degree approach to design has set her aside from other designers of her generation. Born in the UK in 1984, Benjamin Hubert studied Industrial Design and Technology at Loughborough University and graduated in 2006. 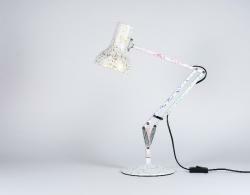 Following successful degree shows, Benjamin exhibited at New Designers 06 with ‘Puff Out Lights’ winning the Corus Material Award and receiving short listings in two further categories. 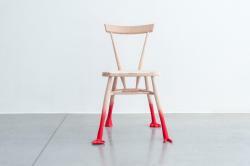 Benjamin Hubert Studio products are exhibited and retailed across the world and have received numerous industry awards. The studio employs a materials and process focused design approach and now works with a range of international manufacturers across furniture, lighting and product sectors. Please note this post is a selection of installation images only. The full installation is not available for auction. Tony joined Wallpaper* as Creative Director in January 2003. He was appointed Editor-in-Chief in March 2007. He has driven the growth of the brand through the development of a hugely successful website, exhibitions and events, and the iconic series of pocket City Guides published in conjunction with Phaidon. Prior to joining Wallpaper*, he was Art Director at Condé Nast’s flagship male lifestyle title, British GQ, for six years. Tony picked up the award for New Editor of the Year from the British Society of Magazine Editors in 2008, and in 2011 was named Editor of the Year for Lifestyle Magazines.